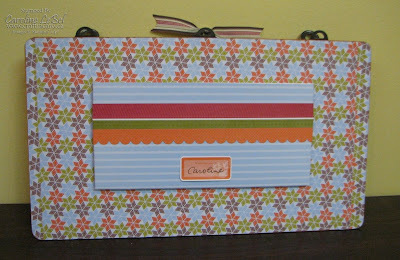 Today I'd like to share with you how I used Stampin' Up! 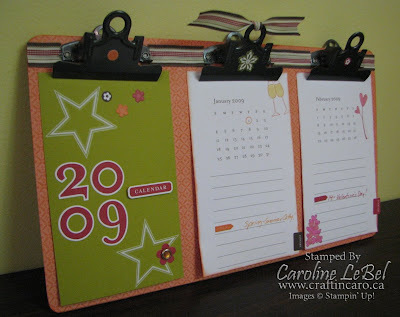 's Create-A-Calendar kit from the Holiday Mini Catalogue and made a fun calendar with our 3-clip chipboard clipboards (try saying that 3 times fast!). I've used our other On Board clipboards before but this was my first time playing with the triple-clip one. Once you figure out how to get around the clips, the rest is easy as the proverbial pie! For tonight's class, I chose papers from the Frosty Day Designer Paper package to cover the front and back of the clipboard. 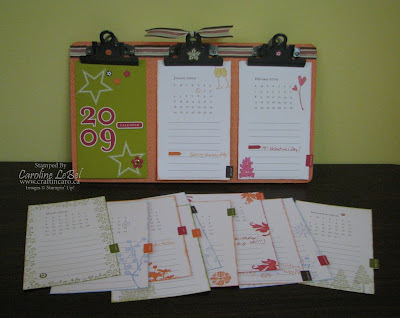 I stamped each month differently, sponged around the white sides for added colour and added the self-adhesive monthly tabs to the sides. The kit even comes with fun little accents that you can add to highlight birthdays, special occasions, etc. You can see that on the back of the clipboard I attached the blue "pocket" to hold all the months together, so they don't get lost while not in use. I'm still trying to decide if I want to adhere some large magnets to the back corners -- maybe I'll put it on the fridge at home? Hmmm... not sure. 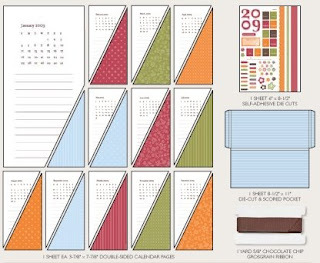 I hope you enjoyed this project as much as I did... next week I'll show you another way to put the Create-A-Calendar kit together to make a desk-top standing calendar!